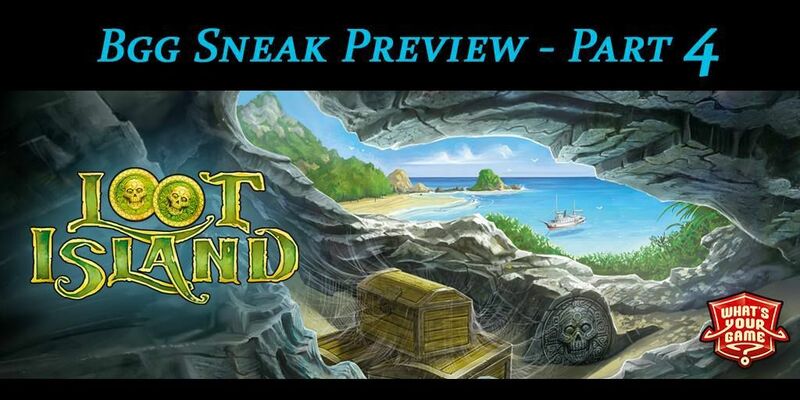 Subject: Loot Island Preview Part 4 - Take the Treasure and RUN! - Loot Island beckons. Today we're going to talk a bit about curses. What are they? How do you get them? And why are they bad? - That seems rather obvious, doesn't it? Curses are bad because they kill you. - Well, yes. Technically. But are they really bad? I mean deep down? Maybe they were just misunderstood? Maybe it's economic anxiety leading them astray? Or being talked down to by blessings? Oh those pretentious, smug blessings. Aren't they the real killers? I mean when you think about it? 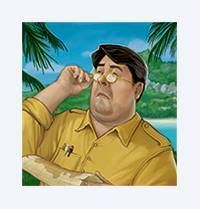 - Exactly, whenever you manage to do that, alone or with the help of other players, you will gain treasure. You draw as many treasure cards as there are treasure symbols in your row of cards. And if you happen to be scoring the longer row of the two; that is to say the big loot, you also draw one card per compass there. - I'm going to assume that with the general vibe of the game so far, you pick one and then let somebody else take a treasure and so on? - Yes, that's it. I think you're really getting into feel of the game now. 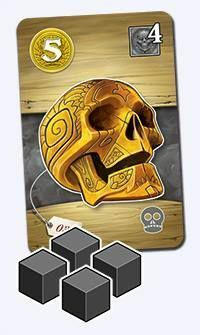 But be careful, for every treasure card also saddles you with curse cubes. Which come in wooden black cubes. Or WBC as they are commonly called. - That is not an actual thing people say. - Aww... well I think it should be. Regardless, every treasure card you pick has an icon in the top right corner, that tells you how many curse cubes you have to take on. Those range from 0 to 5. 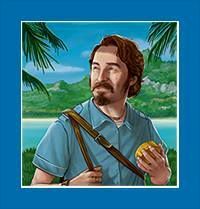 So there are pieces of treasure that the island will let you carry off. - If you say so. But either way, there are also some that the island does not want to let go. - So, what you're saying is that if I only pick treasure with a low number of curses on it, I force other players to pick treasure cards that will doom them? - Technically, yes. I guess you could. You know, I'm really starting to question your willingness to get into the cooperative spirit of this game. - Oh, I'm all about corporation. - Did you say cooperation or corporation? - I did, indeed. More importantly, is there an upper limit to how many curses one player can have? - I'm glad you asked. 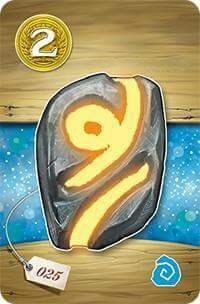 If at the end of the game a player has 13 or more curse cubes on their card, they're out of the game. Dead. A floater. The state of being that awaits you after scratching grandpa's vinyl collection. - I can work with that. But what about players who despite my best efforts end up with less than 13 cubes? I assume they are not dead? - And you would be correct. 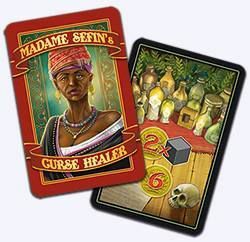 No, if you manage to stay below 13 curse cubes at the end of five rounds, you get to visit Madame Sefin. Island-renowned curse healer. She will take care of your curses. For a price. Healing poitions. Tinctures. A back rub. Reading your favourite chapter of the Communist Manifesto. Whatever it takes to return you to your karmic equilibrium. - Who cares about that? You said something about a price. I assume Madame Sefin has an appropriately cut-throat pricing scheme, considering she is the only healer on the island? - She is smart, yes. But she is not heartless. She will offer as many treatment options as there are cursed players – still alive – at the end of the game. Some options are just one fixed price, some increase based on the number of cubes you want her to heal. Starting with the least cursed player, everyone gets to pick one of the healing options she offers and pay for them out of the treasure they're carrying around. - I like that. If somebody has more curses on them, I can make them pick a more expensive treatment option by taking the cheaper ones first. So they need to pay more, and lower their final score. Maybe even bankrupt them. That is amazing. - Are you sure, you know how healing is supposed to work? - Yeah, bankrupt players by taking away any affordable options to heal themselves. Speaking of which, what happens when a player can't pay for their treatment? - Nice. I think we finally understand each other. So how do you calculate how much your treasure is worth in the end? - That is a far more pertinent question I think, and one we'll look at next time. A video would be nice! The official Gaming Rules! 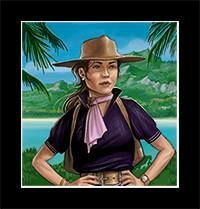 video will be created after Essen, using the retail printing of the game. Mid-November time.